Pastworld is the greatest theme park ever devised. London - the real London - transformed into a living, breathing recreation of the Victorian era. The way the story was told was quite unusual in that there were a variety of view points used to tell the over arching story line rather than one narrator throughout. 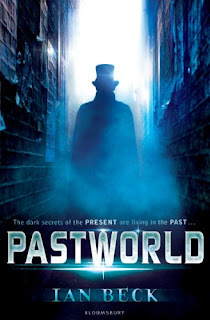 It did mean you got the know the characters less but did mean that you got a broader experience and introduction to the world of the Pastworld theme park. I liked the variety of characters including Eve and Caleb and particularly enjoyed Bible J. I did find Eve a little confusing at first especially her motives behind her decisions but it becomes clear why she has done as she had as the story goes on. I also loved the main villain of the piece as loved how a Jack the Ripper twist was added to the story (you can't have Victorian London without him). The story twisted and turned wonderfully keeping me thoroughly engaged and interested throughout. I didn't see the final twist/outcome until it hit me and actually it made me want to reread the whole thing again to see if I had missed any clues as it put a real ethical spin on the entire story. Awesome book which definitely hasn't been getting the exposure it deserves. A huge thanks to Bloomsbury for sending me a review copy! ooh...this sounds really good. Thanks for the recommendation!